Achieve a Professional Spray Paint Job At Home! There is a rather big misconception that spraying your car is a one-step job. You may think that spraying the car is the most important aspect but that is not true. Professionals will tell you that prep is the most important aspect to any at home spray job. You should take time to ensure the correct prep is done and definitely do not rush it! It is mandatory that you remove all scratches and old peeling paint. Sandpaper with a 30 – 1000 grip should do the job. It’s extremely important that you take time to get rid of all these small bits. As the minute you apply spray paint any small missed marks/paint will quickly become the centre of attention and ruin all the hard work you have put in so far. Your prep should consist of cutting, sanding and priming the surfaces. After that, you need to consider which paint you will go for. 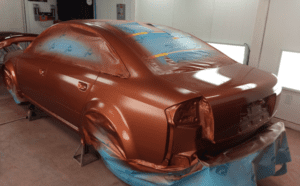 At Bodyshop Paint Supplies, we offer a wide range of auto paint supplies in Melbourne. Our professional spray paint technicians are always on hand inside our store and happy to ensure you find the perfect paint for your specific job. So you have taken time to prep your base to perfection and now it’s time to move onto spraying it. Although before you start spraying you need to consider where you will do it? Hiring a spray booth is often a great way to achieve a professional result whilst also not having to worry about any mess at your home or the fumes. A booth is equipped with ventilation shafts and filters to keep the air inside the booth clean and also create a dust-free environment. They are also temperature controlled to make sure your paint job sets perfectly. 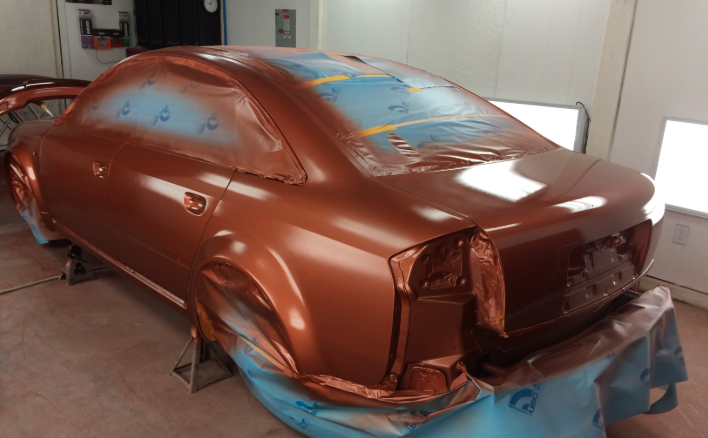 To learn more about our spray booth at Bayswater, click here. Looking to do a full DIY? Then make sure you take the weather into consideration. The ideal temperature for a spray day is 18 to 25 degrees. Any hotter and the paint will dry before it reaches the surface, resulting in it balling up and attaching to the surface. Spraying in humidity can also be problematic and is best to avoid. Try to pick a day that is not windy, as you don’t want dirt or dust being stuck to your fresh paint job. It’s time to spray! If you applied a primer make sure you wai fort at least 24hrs before applying the first coat. You want to hold your spray nozzle approx. 25 to 30 centimeters away from the surface. Using steady even strokes, spray from side to side. Make sure you apply the first coat with a lot of attention and care. Over spraying or under spraying are the most common mistakes that you want to avoid. Remember to keep your spray nozzle clean so that you are spraying a soft mist and not just blobs of colours. With a spray can make sure you shake the can between each back and forth motion. When is comes to recoating, patience is a virtue. Wait 20 minutes in between each coat to avoid paint building up. Doing this will avoid cracks/wrinkles and while also lightly sanding between coats allows you to use less paint to cover the surface smoothly. To learn more about achieving a professional spray job at home, contact the Bodyshop Paint Supplies team today!